Ulster Bank is investing £400k to bring its Entrepreneur Accelerator Hub in-house in its main headquarters, providing even better access for entrepreneurs to the expertise and networks the programme offers. Ulster Bank's Entrepreneur Accelerator hub helps support entrepreneurs throughout the region, with 12 hubs across the UK that have helped over 350 businesses with expert mentoring since launching in 2016. The bank announced yesterday that the programme has now officially moved into its main headquarters in a move designed to provide better access for entrepreneurs to expertise and networks offered as part of the programme. The new hub will continue to be led by Ulster Bank’s entrepreneurship team under Regional Director of Entrepreneurship Lynsey Cunningham. “Our investment in the new space is a natural progression of the Accelerator programme and demonstrates our continued commitment to developing even closer working relationships between entrepreneurs and Ulster Bank – with no cost for those that are successful in securing a place on the programme. By creating a bespoke environment for entrepreneurs inside the bank’s own premises, our current intake will have access to an even wider network of experienced and knowledgeable mentors.” - Lynsey Cunningham, Regional Director of Entrepreneurship. Taking the hub in-house to the first floor of the bank building in Donegall Square East has been a significant undertaking, representing an investment of £400,000 to create a new fit-for-purpose workspace with a range of work and relaxation spots and meeting zones. The new space was developed in part based on feedback from the scheme's previous crop of entrepreneurs and will facilitate the 72 entrepreneurs currently in the programme. 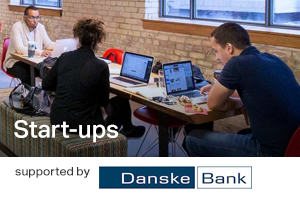 Ulster Bank’s Head of Northern Ireland, Richard Donnan said that "This is a fantastic time for the entrepreneurs on the Accelerator programme who will have cutting-edge work space with top of the range facilities to call their own. But it also presents a great opportunity for the bank as a whole. We want to work collaboratively with the Accelerator programme to create a more entrepreneurial culture throughout our broader business teams."